Predict the direction of shift for an equilibrium under stress. Once equilibrium is established, the reaction is over, right? Not exactly. An experimenter has some ability to affect the equilibrium. Chemical equilibria can be shifted by changing the conditions that the system experiences. We say that we “stress” the equilibrium. When we stress the equilibrium, the chemical reaction is no longer at equilibrium, and the reaction starts to move back toward equilibrium in such a way as to decrease the stress. The formal statement is called Le Chatelier’s principle: If an equilibrium is stressed, then the reaction shifts to reduce the stress. There are several ways to stress an equilibrium. One way is to add or remove a product or a reactant in a chemical reaction at equilibrium. When additional reactant is added, the equilibrium shifts to reduce this stress: it makes more product. When additional product is added, the equilibrium shifts to reactants to reduce the stress. If reactant or product is removed, the equilibrium shifts to make more reactant or product, respectively, to make up for the loss. In which direction—toward reactants or toward products—does the reaction shift if the equilibrium is stressed by each change? If H2 is added, there is now more reactant, so the reaction will shift toward products to reduce the added H2. If NH3 is added, there is now more product, so the reaction will shift toward reactants to reduce the added NH3. If NH3 is removed, there is now less product, so the reaction will shift toward products to replace the product removed. It is worth noting that when reactants or products are added or removed, the value of the Keq does not change. The chemical reaction simply shifts, in a predictable fashion, to reestablish concentrations so that the Keq expression reverts to the correct value. How does an equilibrium react to a change in pressure? Pressure changes do not markedly affect the solid or liquid phases. However, pressure strongly impacts the gas phase. Le Chatelier’s principle implies that a pressure increase shifts an equilibrium to the side of the reaction with the fewer number of moles of gas, while a pressure decrease shifts an equilibrium to the side of the reaction with the greater number of moles of gas. If the number of moles of gas is the same on both sides of the reaction, pressure has no effect. What is the effect on this equilibrium if pressure is increased? According to Le Chatelier’s principle, if pressure is increased, then the equilibrium shifts to the side with the fewer number of moles of gas. This particular reaction shows a total of 4 mol of gas as reactants and 2 mol of gas as products, so the reaction shifts toward the products side. What is the effect on this equilibrium if pressure is decreased? Because temperature is a measure of the energy of the system, increasing temperature can be thought of as adding energy. The reaction will react as if a reactant or a product is being added and will act accordingly by shifting to the other side. For example, if the temperature is increased for an endothermic reaction, essentially a reactant is being added, so the equilibrium shifts toward products. Decreasing the temperature is equivalent to decreasing a reactant (for endothermic reactions) or a product (for exothermic reactions), and the equilibrium shifts accordingly. Predict the effect of increasing the temperature on this equilibrium. Because energy is listed as a product, it is being produced, so the reaction is exothermic. If the temperature is increasing, a product is being added to the equilibrium, so the equilibrium shifts to minimize the addition of extra product: it shifts back toward reactants. Predict the effect of decreasing the temperature on this equilibrium. In the case of temperature, the value of the equilibrium has changed because the Keq is dependent on temperature. That is why equilibria shift with changes in temperature. A catalyst is a substance that increases the speed of a reaction. Overall, a catalyst is not a reactant and is not used up, but it still affects how fast a reaction proceeds. However, a catalyst does not affect the extent or position of a reaction at equilibrium. It helps a reaction achieve equilibrium faster. Hydrangeas are common flowering plants around the world. Although many hydrangeas are white, there is one common species (Hydrangea macrophylla) whose flowers can be either red or blue, as shown in the accompanying figure. How is it that a plant can have different colored flowers like this? This species of hydrangea has flowers that can be either red or blue. Why the color difference? Source: “Hydrangea” by Janne Moren is Licensed under the Creative Commons Attribution-NonCommercial-ShareAlike 2.0 Generic. Interestingly, the color of the flowers is due to the acidity of the soil that the hydrangea is planted in. An astute gardener can adjust the pH of the soil and actually change the color of the flowers. However, it is not the H+ or OH− ions that affect the color of the flowers. Rather, it is the presence of aluminum that causes the color change. The solubility of aluminum in soil—and thus the ability of plants to absorb it—is dependent on the acidity of the soil. If the soil is relatively acidic, the aluminum is more soluble, and plants can absorb it more easily. Under these conditions, hydrangea flowers are blue as Al ions interact with anthocyanin pigments in the plant. In more basic soils, aluminum is less soluble, and under these conditions the hydrangea flowers are red. 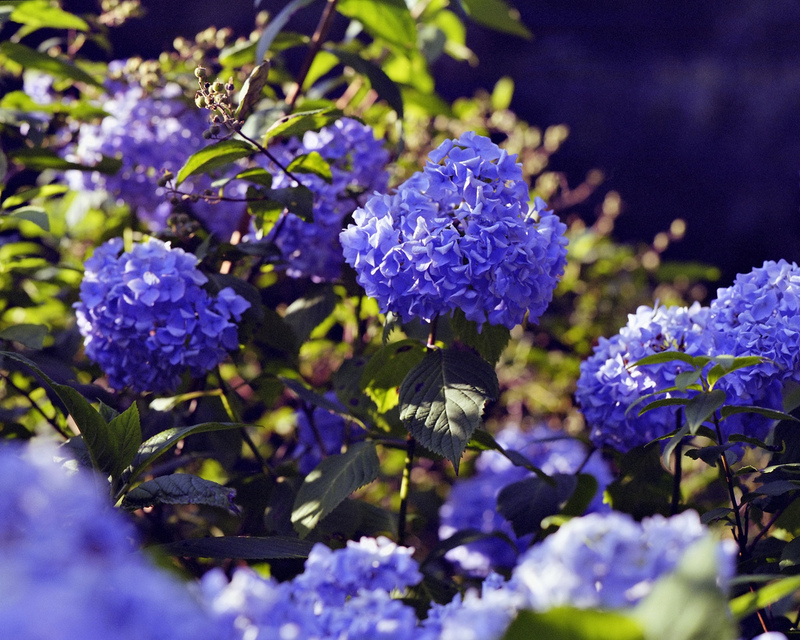 Gardeners who change the pH of their soils to change the color of their hydrangea flowers are therefore employing Le Chatelier’s principle: the amount of acid in the soil changes the equilibrium of aluminum solubility, which in turn affects the color of the flowers. Le Chatelier’s principle addresses how an equilibrium shifts when the conditions of an equilibrium are changed. The direction of shift can be predicted for changes in concentrations, temperature, or pressure. Catalysts do not affect the position of an equilibrium; they help reactions achieve equilibrium faster. What is meant by a stress? What are some of the ways an equilibrium can be stressed? Given this equilibrium, predict the direction of shift for each stress. 4. Given this equilibrium, predict the direction of shift for each stress. 5. Given this equilibrium, predict the direction of shift for each stress. 6. Given this equilibrium, predict the direction of shift for each stress listed. 7. The synthesis of NH3 uses this chemical reaction. Identify three stresses that can be imposed on the equilibrium to maximize the amount of NH3. 8. The synthesis of CaCO3 uses this chemical reaction. Identify three stresses that can be imposed on the equilibrium to maximize the amount of CaCO3. When an equilibrium is stressed, the equilibrium shifts to minimize that stress. Shifting Equilibria: Le Chatelier’s Principle by Jessie A. Key is licensed under a Creative Commons Attribution-NonCommercial-ShareAlike 4.0 International License, except where otherwise noted.